Understanding the ingredients in your homebrew is key to taking your brewing skills to the next level. The relationship between brewer's yeast and sugar should be part of that understanding. Sugar is derived from the starches in malted barley. Starches and sugars are both forms of carbohydrates but, sugars can be broken down by yeast during fermentation into alcohol and carbon dioxide. Turning starches into sugars is what happens in the mash. Once the mash is complete or you have added the malt extract to your brew pot, you have wort. Wort from a pure barley mash contains four main sugars that we are interested in: fructose, maltose, glucose, and sucrose. All four are fermentable by brewer's yeast although maltose ferments a little bit slower. The fifth type of sugar that often finds its way into the brew pot is lactose. Lactose does not come from barley, rather it comes from milk, which can pose a problem for vegan beer lovers. Adding lactose to a beer adds a little sweetness and adds to the body of the beer. Traditionally, milk was added to the brew, thus we have milk stouts, but these days most brewers buy lactose that has been processed out of milk. We hardly ever think of sugar in such technical terms, do we? If you say sugar to us, we will most likely picture the granulated cane sugar that we sometimes add to our tea or mix in apple pies. There are many sources of sugar and every one of them has found their way into beer at some point or another. We have already discussed malt extract which comes from barley. It comes as both a syrup and granulated. The syrups often come in varying degrees of color. Most homebrew recipes call for a combination of both. It is good to experiment with malt extracts, to stray away from the recipes, so you can get an understanding of how they affect a beer. If you are an all grain brewer, it is not a bad idea to keep a few around in case you are unhappy with the yield of a mash. Cane, beet and corn sugars all work about the same in homebrew. Adding them will increase the alcohol content of the final beer but they will do nothing to improve the flavor or character of the beer. They should be used sparingly as too much will contribute a hot or cidery flavor to the beer. If you have ever both priming sugar from a homebrew supply shop it is very likely corn sugar. Using it as directed to prime and therefore carbonate your bottled beer works just fine. Brown sugar works just like the white sugars described above except that it will add just a touch of color and flavor to the beer. However, using enough to be significant could lead to off flavors so we really do not recommend it. Molasses and sorghum are very interesting sugars to use in brewing. Although they work similarly, they are not the same thing. Molasses is a byproduct of sugar refinement. It is the impurities and un-crystallized sugars that result from processing the purer forms of sugar described above. Sorghum, which is sometimes confusingly sold as sorghum molasses, is a syrup derived from the juices of the sorghum plant. As you know, both are rich in color and flavor and their addition to beer can be very interesting, giving it a rich and buttery quality. They are certainly worth experimenting with although, once again, we encourage you to use them sparingly. You will be surprised at how much just half or a whole cup will have on a five gallon batch of beer. Maple syrup is another processed sugar worth discussing. We must confess that we have never enjoyed a maple syrup beer. We have not had many but in every case, we found the maple syrup overwhelming, even in dark ales. However, beer is subjective and, who knows, you might just love it. Experiment away, just start small and see what you think. We enjoy using natural sources of sugar adjuncts much more than processed. They are less likely to cause off-flavor problems during fermentation and the flavors they contribute are simply more interesting. Honey is a popular one. If you pop over to your favorite good beer shop you will be able to find some honey beers but they will probably represent less than 5% of the store's total stock. Go to a homebrew competition or meeting of homebrewers and around 50% of the beers will have honey in them. There is just something about adding honey to a brew pot that grabs the imagination of the average homebrewer. Honey is mostly glucose and fructose so it is easily fermentable by brewer's yeast, especially when it has been kick-started by malt sugars. It also contains a variety of other stuff that adds to its complexity and unique flavor. Unlike processed sugars, you can add as much honey as you like. There is a wide variety of honey out there. The stuff at the grocery store, usually called clover honey although it is more accurately wildflower honey, is fine for what it is and can be used to make great beer. However, there are varieties of honey available if you seek them out. Orange blossom honey is made from the nectar from orange trees in bloom. We have seen sage honey, peach blossom honey, and even avocado honey. The possibilities for invention in the homebrew laboratory are endless. Imagine a Belgian wit with orange blossom honey or how about a sweet stout with sage honey? Another obvious source of natural sugar is fruit. Fruit can be tricky, especially for homebrewers. The urge is to use fresh fruit; it just seems more honest, somehow. But fresh fruit is teeming with all sorts of microbes, all poised to infect and ruin your homebrew. The solution, of course, to add the fruit during the boil to pasteurize it. That works but it can drive away some of the more delicate flavors and aromas of the fruit that may have been the reason that you chose it. Also, when boiled too long, the pectin in fruit can cause clouding issues in the final beer. Most pro-brewers we know use canned fruit when they make a fruit beer. It comes pre-pasteurized and it is a heck of a lot easier to open a few cans rather than slice and pit a few bushels of peaches. Fresh or canned, fruit can add another problem if you transfer it to the fermentation vessel. We like to do this because it adds more of the fruit flavor and give the yeast a chance to dig in and ferment more of that good fructose sugar. To problem is that the fruit fibers can clog up your airlock. This is especially likely during krausen. The best thing to do is to do primary fermentation in a bucket that is really too big for the job. Monitor the airlock to make sure it does not clog up. After high krausen, probably four days or so, carefully pure the beer through a sanitized filter and transfer to a glass carboy. Ferment as usual although a third racking may be necessary. Vegetables are another interesting choice although We have never had a vegetable beer that really excited me. Even so, they can be fun to experiment with. They work about the same as fruit. Grains other than barley are another natural source of sugar that brewers and homebrewers alike enjoy experimenting with. However, like malting barley, they have to be manipulated before they will release their sugars. Only all-grain brewers can use raw grain. Raw grain needs to be cracked the same as your malted barley and boiled in water for at least 30 minutes. Then, after letting it cool a bit, add the lot to an active mash. These grains must be mashed with your barley because you are relying on the enzyme in the malt to break down the starches. If you can find your grain flaked at your homebrew shop, you can skip the boiling step, it has been done for you. Just add the flaked grain to your mash tun when you add the barley. Most grains do not add a lot to beer besides more sugar for more alcohol. Wheat builds up the body making it near silky when enough is added and is, of course, an essential ingredient for the great Bavarian wheat beer varieties. Rye is said to make the beer drier and crisper although we have to admit that we have never noticed a difference. Rice and corn have gotten a bad rap thanks to their liberal use by big brewers of pale lager. In our opinion, grains are mostly a lot of trouble and not really worth it for the homebrewer looking for a better tasting beer. But you know what opinions are like, right? Is There a Most Important Ingredient in Beer? How Does Malted Barley Factor Into the Brewing Process? 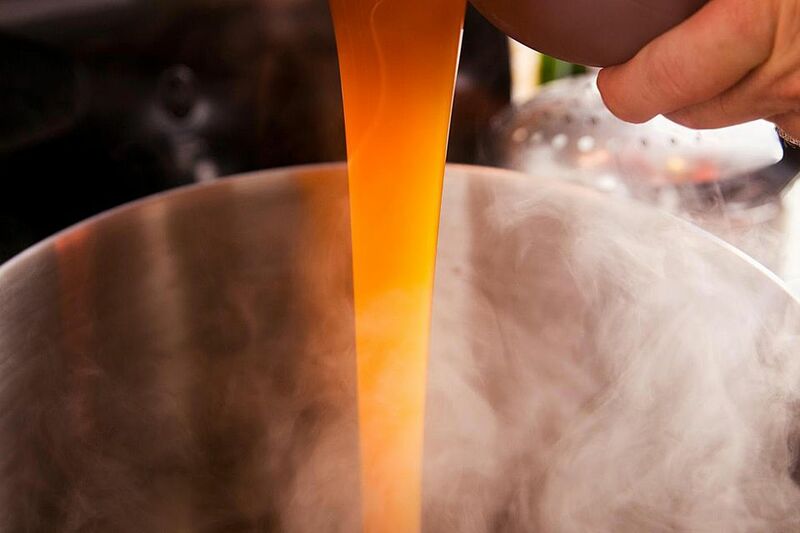 How Does Wort Affect Your Home-brewed Beer? How Did Beer End Up in a Can? Beer Carbonation: What Makes It fizzy? Creating great tasting cocktails at home is easy once you have some recipes. Get our recipe book free when you sign up for our newsletter.